I'm a big germ freak, I enjoy having a clean home and as a single parent my children depend on me to take on all of the household chores. From laundry to dusting, I do it all, even the dirtiest of jobs like scrubbing the bathroom! 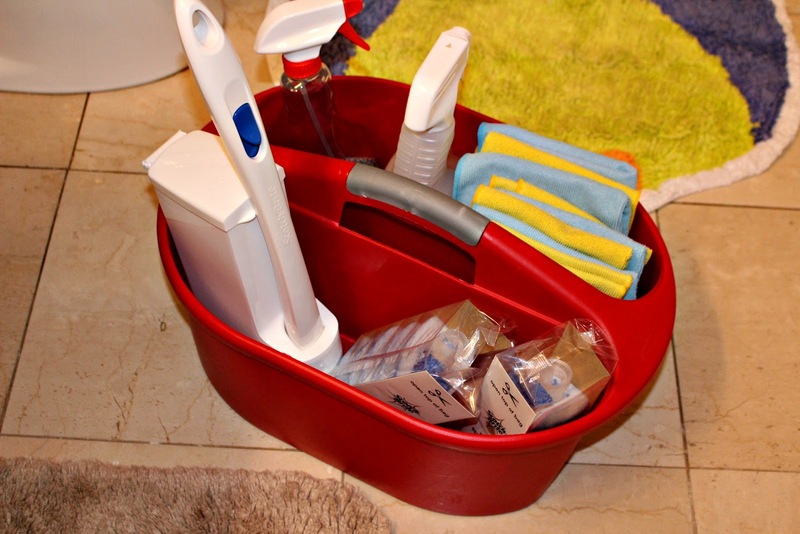 Cleaning your bathroom and keeping it clean is much easier than you think! I've learned a few tips and tricks over the years, and now I can have our bathroom from gross to sparkly clean in less than 30 minutes! That means I'm spending less time cleaning and more time playing with my children and I know every mom wants that! While picking up some after school snacks at my local Krogers, I remembered I needed some things from the cleaning isle! 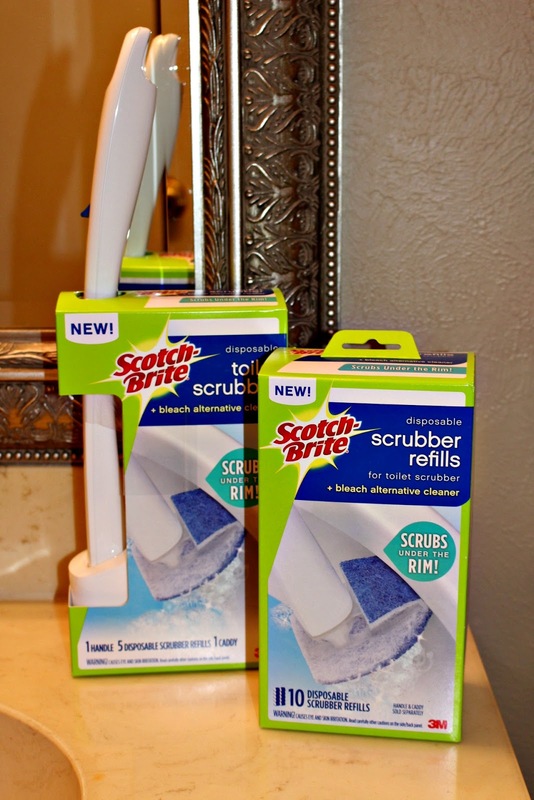 I easily located the New Scotch-Brite® Disposable Toilet Scrubber and New Scotch-Brite® Disposable Scrubber Refills and couldn't wait to get home and put them to work on my toilets! So are you ready to get started? Let's tackle that germ-filled zone together! Be sure to grab all of the cleaning supplies you will need, in my bathroom cleaning caddy I keep - microfiber cloths, a glass cleaner, an all purpose cleaner and New Scotch-Brite® Disposable Toilet Scrubber and New Scotch-Brite® Disposable Scrubber Refills! Tackling your bathroom can be a little overwhelming, to get started I clear everything off the sink/counter, start by cleaning your mirrors, then work down and disinfect your sink. Once thoroughly clean you can replace items and move onto your toilet, this is where the fabulous Scotch-Brite® Disposable Toilet Scrubber comes in handy! Spray down your toilet tank and the seat, wipe them down and then use the Scotch-Brite® Disposable Toilet Scrubber to scrub the messes inside the bowl you've been leaving behind! It reaches under the rim that other competing products might miss and features the genuine Scotch-Brite® brand scrubbing power! The Scotch-Brite® Disposable Toilet Scrubber is so easy to use, just load the inside of the caddy with Scotch-Brite® Disposable Scrubber Refills, snap one into place, scrub and toss - that's it! 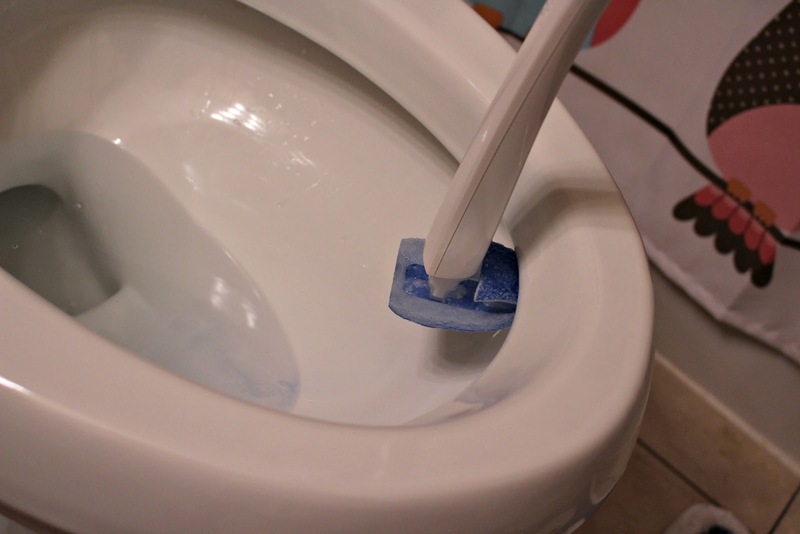 The flexing head design allows maximum contact with the toilet bowl, it's shaped to access stains hidden under the rim and the Scotch-Brite® Disposable Toilet Scrubber features a built-in bleach alternative cleaner with pumice that scrubs away rust and hard water stains. Hang in there, we are almost done! Don't forget to hand wipe the outside base of your toilet as well, then it's time move on to the shower/tub. Spray down and disinfect your shower/tub, wipe it clean with your microfiber cloth and your ready to go! If your bathroom is small, you can hand wipe and disinfect the floors as well for quick touch ups, or grab a broom and mop for a deeper clean! Toilets are my least favorite thing to clean but the New Scotch-Brite® Disposable Toilet Scrubber and New Scotch-Brite® Disposable Scrubber Refills really make it a breeze! So what do you think? Want to find more great cleaning inspiration? Check them out here! Look for the Instant Redeemable Coupon on the Scotch-Brite® Disposable Toilet Scrubber: “Try Me Now! Save $2”. The coupon can be redeemed at the register upon checkout. Cleaning toilets is definitely one of the worst cleaning duties there is! Ugh, especially with my little boy who doesn't always aim right, I end up cleaning our toilets twice a week (sometimes more). I haven't tried this toilet scrubber, but I like that it's disposable! Thanks for the coupon, I think I may just try it out.